The blue-crowned conure is a classic conure in many ways, but this medium-sized parrot is slightly quieter and gentler than most of the other conure cousins. This green bird with the bright blue head and spiked tail is a gentle, intelligent, playful creature that can make a great pet. This is the small parrot that starred in two movies: Pauly; and the documentary film, The Parrots of Telegraph Hill. The blue-crowned conure is known by a variety of additional common names, including blue-crown conure, blue-hooded conure, blue-capped conure, blue-crowned parakeet, and sharp-tailed conure. Blue-crowned conures are native to South America, with a range that extends from eastern Colombia to northern Argentina. The preferred habitat includes savannah-like grasslands, woodlands, and forest margins. It is not found in dense humid forests. The blue-crowned conure grows to an adult size of 14 to 16 inches, from the tip of the beak to the end of the spiked tail. In captivity, this bird can easily live up to 30 years with the right care. These birds are very affectionate and social creatures, and they bond strongly to the owner who treats them well and gives them the attention they crave. Blue-crowned conures rarely bite, making them a good pet for families with children. Although a bit quieter than other conure species, it should be acknowledged that no conure is a quiet bird, and this species will be quite noisy in the morning and evening, which can create problems with close neighbors. With a known capacity for screaming and shrieking, this isn't the best bird for apartment life. Although conures, in general, do not talk as much as other types of parrots, the blue-crowned conure ranks as one of the better conure talkers. They are capable of learning several words and short phrases. When born, the blue-crowned conure has a head that is actually reddish in color, but it changes to bright blue by the time they reach maturity. In addition to the signature parakeet green body and the blue head, blue-crowned conures have reddish tips on their tail feathers, pink legs and feet, horn-colored beaks, and white rings around their eyes. Males and females are identical in color and pattern. 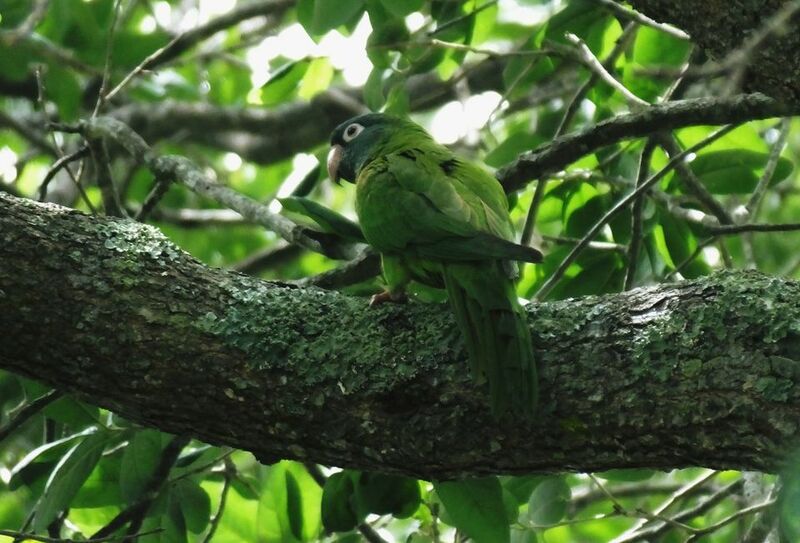 The blue-crowned conure breeds readily in captivity, and this is one of few parrot species that is relatively easy to find in pet stores, as well as from breeders. This is not a bird you should plan to leave confined in a cage most of the time. The blue-crowned conure is a highly social bird that spends its time in a flock when living in the wild—in captivity, you will need to serve the function of its flock-mates. Your conure will want to be out of the cage and interacting with you for as much of the time as it can talk you into. Since it is usually not possible for your pet to be out of the cage all the time, give it a good, spacious enclosure and fill it with good toys that it can chew, which will provide it with both exercise and stimulation. Be prepared to give your bird at least 3 to 4 hours of time out of the cage each day. A freestanding play structure somewhere outside the cage is a good idea. Many owners report that a blue-crowned conure is much happier when it has another bird as a companion. It may also be happier if you leave a television or radio playing when you need to leave the bird alone in the house. These birds are best trained by ignoring bad behavior and rewarding good behavior with attention and treats. There is no training that will turn this naturally noisy bird into a quiet one. Attempts to scold the bird when it screams will only make it louder. Blue-crowned conures are fairly good talkers, and with proper training can learn a number of words and phrases. In the wild, blue-crowned conures normally feast on a varied diet of fresh fruits, vegetables, nuts, berries, and grains. Conures in captivity need an equally varied diet consisting of fresh fruits and high-quality pellets. Conures fed only seeds and nuts often have health issues. A blue-crowned conure is a species with a naturally high energy level, so it needs a solid 2 hours of out-of-cage exercise each day—this is time that can also give the bird some of the essential social interaction it craves. Make sure your conure has access to plenty of toys they can chew to exercise its jaw muscles. Without toys to chew, your conure may direct its instincts to chewing on furniture or woodwork. All conures can be prone to feather picking, which usually occurs because they are getting insufficient attention and stimulation. Offering it plenty of social interaction and access to toys will usually prevent this.